3. Wait for 10-15 minutes, and then tear off the strip. 4. If you feel pain when tearing, spray water on nose, and then gradually tear off. 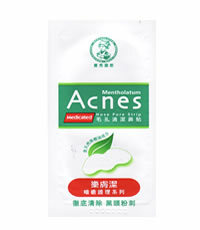 This entry was posted in 1 and tagged ACNES NOSE PORE STRIP, Fr3b, Free giveaways, free samples, freebies, Mentholatum, samples, S’pores 1st Sampling Concept Store, singapore free beauty samples, singapore’s 1st online sampling platform, skincare, www.fr3b.com. Bookmark the permalink. Hi, tried this product in store before. Works wonders on all those black and white heads on my nose. Used to squeeze them out, but now with the nose pore pack, it does the work for me without all the pain. Gross to see all those blackheads after that, but hey, at least they are removed from nose.